Wishing you a Happy and Fashionably Prosperous New Year full of Good Health, Much Love, Peace, Happiness, Success, Fun, Global Fashion and La Joie De Vivre. 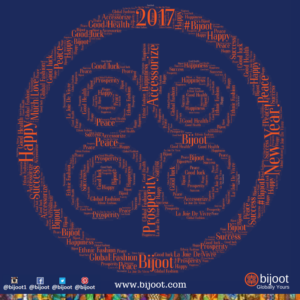 We hope you’ll get to Bijoot Yourself (*) with some fabulous Bijoot items this year! May all of your wishes come true in 2017! ~Cheer! See something you want? Share and get 17% OFF your Purchase. Previous PostBring your style to life with Bijoot this Fall/WinterNext PostHappy 4th of July!